The Cybersecurity plan described how the security program will protect and share information counter new threats and evolving threats. Nepal First Cybersecurity Meetup Speaker Introduction – Shambhu Khanal from Nepal Telecom. Shambu Khanal is an Engineer at Nepal Telecom. 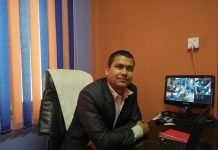 He has completed a Master Degree in Computer Engineering From Kathmandu University. He has extensive experience in Cyber and Information Security along with Network and Cloud Security. He is Presented the Strategic Plan of Cyber Security in Nepalese Organizations.